I had intended to make a pork loin for dinner tonight until I realized this morning that I didn’t have all the necessary ingredients for the stuffing, so I have flipped the pork loin until tomorrow and am making a roast chicken recipe instead. 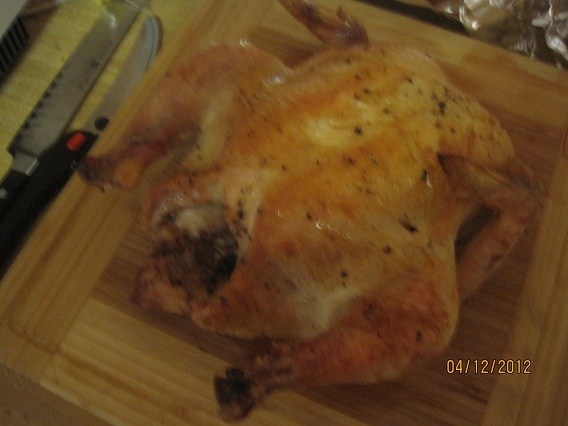 I have made roast chicken before, but this recipe is a little different. I got this one from Bon Appetit. They are running on article called 5 Dinners For Under $100 and this is the first dinner they mentioned. It’s a very inexpensive meal of roast chicken with a warm parsley sauce, oven glazed carrots and I am making some rice to go with it. The chicken itself only cost me $4.50 ($9.00 actually, since they were packaged as 2 whole chickens, about 3 pounds each), and everything else in the recipes I already had in the house, so it’s easy and cheap! Generously season the chicken inside and out with salt and pepper. Pre-heat the oven to 425 degrees. Heat 1 tablespoon of the olive oil in a large cast iron or other ovenproof skillet over medium-high heat. Place the chicken in the pan, breast side up, and cook until the skin is brown, about 6-8 minutes. Tip the pan to one side to gather the accumulated fat and juices and baste the top of the chicken. Return the pan to the oven and cook the chicken until an instant-read thermometer inserted into the deepest part of the thigh registers 165 degrees, about 50-55 minutes. Transfer the chicken to a carving board, rib with the garlic halves, and let rest for at least 10 minutes before carving. Pour off the fat and juices from the skillet, leaving the browned bits in the pan; set the skillet aside. 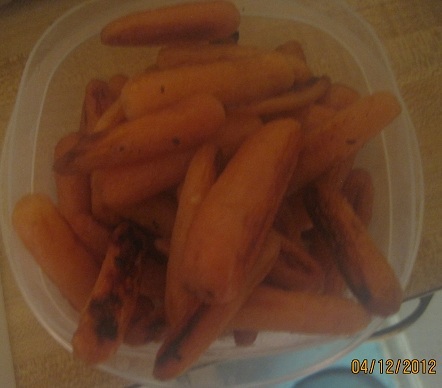 Meanwhile, combine the carrots, 1 tablespoon of olive oil, honey,and cayenne in a small bowl; toss to coat. Place the carrots on a rimmed baking sheet in a single layer and bake until the bottoms of the carrots are golden brown, about 20 minutes. Stir and cook until the carrots are tender and brown, about 5 minutes longer. Whisk the remaining 3 tablespoons of olive oil, minced garlic, parsley and lemon zest in a small bowl. Heat the reserved skillet over medium heat. Pour in the parsley oil and cook, scraping up the browned bits from the bottom of the pan, until heated through. Add 1 tablespoon of lemon juice and swirl the pan to mix. Season the sauce to taste with salt and more lemon juice, if desired. Serve warm parsley sauce alongside of the chicken and carrots. I added some rice to the dish to complete the meal, but it was very easy to make overall. Tomorrow night, I promise, is the Apple and Prune Stuffed Pork Loin. It’s a little more labor intensive than tonight’s meal, but we have had it before and we loved it. Until then, enjoy your evening and enjoy your meal!